Noble Obsession follows the life of Charles Goodyear, a single-minded genius who risked his own life and that of his family in a quest to unlock the secrets of rubber. He didn’t start the tire company that bears his name, but he did change the world forever. 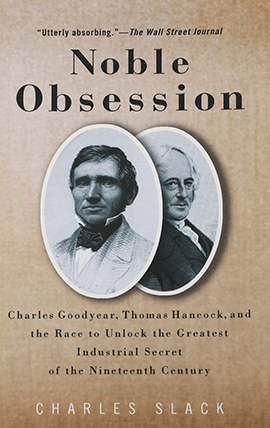 In rich, historical detail, Noble Obsession chronicles the personal price Goodyear paid in pursuit of his dream, and his bitter rivalry with Thomas Hancock, a scholarly English inventor who got wind of Goodyear’s discovery and beat him to the patent office. Noble Obsession tells one of the strangest and most affecting sagas in the history of human discovery. Slack is one of the most graceful writers anywhere. His remarkable new book chronicles Goodyear’s often lonely pursuit of the process that transformed rubber form a curiosity used mainly for pencil erasers into one of the essential elements of modern life. Charles Slack has plucked a gem from American history . . . Slack possesses an uncanny knack for weaving the threads of life and history into a powerful tale. Named one of the 25 best “Books to Remember” for 2002 by the New York Public Library. Charles Goodyear, forty-two years old, sick, tired, poor, and exhausted, eagerly awaited word from England. For the past eight years he had devoted himself with monomaniacal zeal to his quest. He had endured poverty, ridicule, life-threatening illnesses, jail, and self-torment in the knowledge that his wife and children had suffered as much or more than he. He had overcome false starts and dashed hopes too numerous to remember. Long after his wisest friends had given up on him, Charles Goodyear endured. Now at last, he had the answer. For years he had feared that he would die before the world recognized the essential truth: Charles Goodyear was no lunatic, but a visionary with a great gift to bestow on mankind. He felt certain that vindication was at hand, that he had won. He did not know that the race had just begun. My interest in inventor Charles Goodyear began when I happened across his name in an encyclopedia and assumed (like most people) that he was the man who started the tire company and probably died rich and happy in Ohio. The actual story of Goodyear’s life turned out to be something much different—darker, sadder but infinitely more fascinating. The more I learned about Goodyear’s struggles as a half-mad inventor who nearly starved himself and his family, but whose struggles helped make the modern world possible, the more I knew he was someone worth writing about.